I’m not sure how many of you stress out each week about what to feed your families, but I know I do. I am constantly frustrated with the hours I waste each month looking through cook book after cook book trying to find something for dinner that will be healthy, quick, and yummy. I get tired of eating the same things over and over and I want to expose my children to different types of food so they learn to try new things. I also really struggle with finding new ways to prepare veggies…. oh how tired I am of bagged salad with Ranch dressing! And, how about an alternative to Pasta Roni as a side dish? But mostly I just don’t want to have to make the decision of WHAT to eat every week. 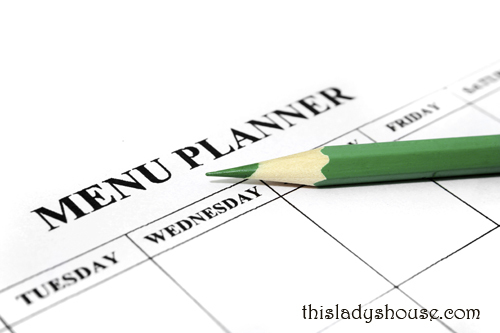 I have set a goal for myself to create a complete dinner menu for 52 weeks, 5 days per week. My goal will be attained when I have completed a menu with a main course, a vegetable, and a side dish. Keep in mind that not all meals need to have all three courses, some meals (like soup) are a great catch-all, but most meals are much more enjoyable if there is a well orchestrated assortment. I will do my best to maintain the following guidelines. – Make a note if the item is affected by the seasons, (i.e. dinner in a pumpkin is most likely to be feasible in the fall). – Make note if the item can be frozen. I don’t know about anyone else but I love to double a recipe, eat one portion today and eat the other one in a month. – Pick recipes that are not too difficult or time consuming (this is supposed to be a time saving tool). – Avoid using things like Taco’s, Spaghetti, Hamburgers, etc. I already know how to make these things (I may use these as filler recipes occasionally). -Try to balance the week with different types of food. I like to rotate chicken, beef, pork, and pasta…. then I throw in a bit of seafood and some vegetarian options. I would be happy if anyone would like to send me their favorite dinner menus, complete with vegetable and side dish. I will also start making mention of my weekly project plans. I will list these on Sundays where there is plenty of space. Is there something you would like to see mentioned in the weekly calendar that would make feeding your families a bit easier? Add a comment and let me know! This entry was posted in On the Stove and tagged Food Storage, How To, Organization.